In a season of summer blockbusters that wow us with giant action sequences, special effects coming out the wazoo and, sometimes, big laughs, it’s a relief to see a movie that takes storytelling back to its core, follows the classic “happy ending” formula, and along the way adds tons of original and hilarious elements that makes for the most original movie of the summer. “Stardust” is simply a fairy tale, about a young man on a quest to get his crush to fall in love with him by finding a fallen star in a mystical realm where danger lurks at every turn. It turns out the young man has a destiny as a hero, and as the film goes on, he develops from a young adult into a man. Yes, “Stardust” is as classic a fairy-tale formula as you can find, but it’s the way it handles its formulaic plot in such an original and fresh way makes “Stardust” such a great movie. The film takes the simple formula of a young man on a journey (for love, naturally) and simply loads extra plot elements, one on top of another, to keep the audience riveted for two hours. Tristan, the young man, is in love with the local girl Victoria, but to win her hand in marriage, he must cross “the wall,” and find a fallen star. The wall is a bridge between England and another world, and in this world, all sorts of fantastical things happen. Tristan crosses the wall, and finds the star to actually be a beautiful young lady. What they don’t know is that Yvaine, the star, fell because of the king of this realm’s last act on his deathbed. His sons, all vying for the throne once he passes on, argue so much he takes a pendant, and enchants it so that it will turn into a red ruby for the boy in the family destined to be king, and throws it into the sky. The pendant hit Yvaine, and she fell from the sky, still possessing the pendant all the brothers seek. At the same time, three old witches seeking to regain their youth see the star fall, and one of them goes after it because with the fallen star, they can become young again. With fighting brothers, evil witches, and generally greedy villains on their tail, Tristan and Yvaine must fight, talk, and sneak their way back home. It’s really hard to put the plot into words. All I can really say is that the movie surprised me, a lot. The trailer made the movie look like a string of horrible, cheesy jokes and bad action, but that couldn’t be further from the truth. I won’t lie; I loved this movie. From start to finish, it’s tons of fun, lots of laugh, and also has the real heart and emotion a good fairy tale needs. It’s like being read a great bed time story, but with an 80-million dollar budget. The movie is wildly creative, and I don’t want to spoil the many jokes and surprises the movie has in store. There’s lots of great talent in the movie; Claire Danes as Yvaine is great casting; she plays the role very sincely, and it works extremely well. Relative unknown Charlie Cox stars as Tristan, and, like Danes, plays it sincere. They’re a great pair, with lots of chemistry. Michelle Pfeiffer is the witch Lamia, who ages whenever she uses magic, and is wickedly evil in the role. But Robert DiNiro steals the show as Captain Shakespeare, a captain on a flying ship that isn’t as cutthroat as he says he is. If you ever want to see just how versitle an actor DiNiro is, watch The Godfather Part II, and then go see “Stardust”. The movie has lots of humor, too, coming from clever lines, sight gags, or recurring jokes that get funnier each time. The action is great too, with some really great swashbuckling scenes near the film’s climax. The music enhances everything; it’s a strong, rollicking score that really gets the blood pumping. But why “Stardust” works is that it’s not only a combination of great talent, writing, and action, but it doesn’t try to be more than a fresh, new fairy tale. It great fun in the spirt of Brothers Grimm stories; it’s dark and violent, but also light and funny and in the end, all is well. Trust me, you will know how the film will end in the first few minutes, but that doesn’t make the journey any less exciting. 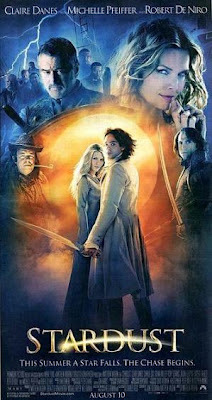 “Stardust” is a “Princess Bride” for the 21st century, a movie that hopefully will be viewed and enjoyed by audiences everywhere. But in a summer when films like Spider-Man 3, Transformers, and Harry Potter take center stage, its unlikely “Stardust” will be remembered as one of the summer greats. It absolutely deserves to be recounted with those movies, and is a great break from fighting robots, dueling wizards or vigilante spiders. “Stardust” takes moviemaking back to its core of telling a good, fun, story and throwing in more than enough twists to make it interesting. It is highly recommended.